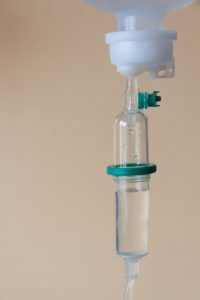 Intravenous (IV) fluids are commonly used in veterinary medicine. These products are subject to the FDA-Center for Veterinary Medicine’s Compliance Policy Guide (CPG Sec. 635.100) for Large Volume Parenterals (LVPs) for Animal Use. Veterinary IV fluids do not necessarily require a formal approval process to be used, but must meet the FDA-CVM’s requirements as further described below. Be sterile, preservative free, and supplied in sizes appropriate to label claims facilitating use of the contents promptly following initial entry. Labeled to indicate that: (a) they contain no preservatives, (b) they are intended for use promptly following initial entry, and (c) any portions not used promptly should be discarded, and clearly indicate concentration of individual ingredients and physiological parameters of the solution. Comply with other applicable labeling requirements in the FD&C Act and its implementing regulations, including 21 CFR Part 201. Manufactured in accordance with current Good Manufacturing Practices by an establishment that is registered with FDA and the LVP is drug listed with FDA in accordance with section 510 of the FD&C Act (21 U.S.C. 360).